Leslie Model 22H | MOSweb Online! The model 122 cabinet is shown at left. 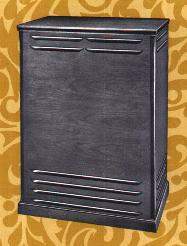 The 22H cabinet is very similar in appearance to a 122 or 147, the largest difference is that the upper horn speaks through only one level of louvers, not two as shown here. This model was made specifically for the balanced output of a Hammond “G-G” Console (IE Model B or C). The 22H is simply a 21H with a different amplifier. This newer design amplifier eliminated the use of an ELECTRO-dynamic 15″ woofer, so these cabinets also have permanent magnet 15″ woofers.